Visit the BangorBaby Flickr page for detailed descriptions of local playgrounds! It’s always good to know where the best chance of getting a baby swing is, right? 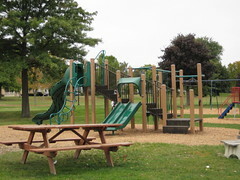 We’ll also throw in a few playgrounds from Beyond Bangor; currently, two of Brewer’s playgrounds have been documented. You can also check out our playground map — the number over various parks tells you how many photos there are of that playground!